One country’s stock market actually hit an all-time high this week – Russia’s. We finish our week-long trip around the equity world today with the piece de resistance, of sorts. Of all the country stock markets that we track in our database, just one traded at an all-time high this week. We are betting that not many folks out there would have guessed that that country is…Russia. 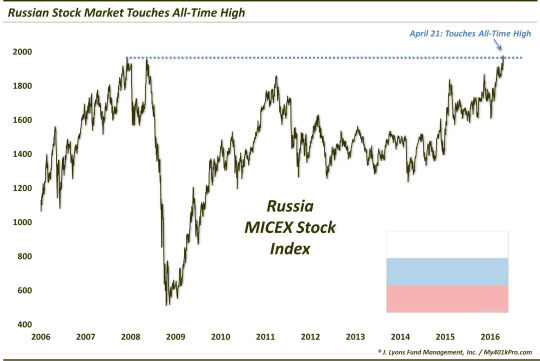 Yet, here was one of the “Russian Bear’s” main stock averages, the MICEX Index, hitting a new all-time intraday high yesterday for the first time since 2007. Now, naturally the first thing that comes to many readers’ minds is the currency effect. The MICEX is priced in Russian Rubles which have obviously been decimated over the past couple of years. That has much to do with propping up the index to the extent that it began 2016 within striking distance of an all-time high. For comparison’s sake, the Russian RTS Index, which is priced in U.S. Dollars, began 2016 some 70% off of its 2008 all-time highs. However, most of the credit for the recent move to new highs goes to the performance of the equities themselves. That is because, year-to-date, the Dollar is actually down over 10% versus the Ruble. And yet, the MICEX is up some 12% for the year, and over twice that since its mid-January lows. Of course, that suggests the RTS is up even more. Indeed, the currency-aided index is up some 25% YTD and more than double that since the lows in January. As U.S. investors have easier access to Russian equities in Dollar terms, obviously the current downtrend in the Greenback has been a tailwind for them recently and will continue to be should it persist (we’re not saying it will or won’t). Regardless of the Ruble’s trend, however, Russian equities have been among the best performers around the globe this year. And the new high in the MICEX is just the cherry on top of our theme this week that, while U.S. stocks certainly continue to make noise, there are plenty of interesting developments in equity markets all over the world.